Local Treks: Hiking Missouri and More: Cache River State Natural Area: Much More Than "Mud & Muck"
Cache River State Natural Area: Much More Than "Mud & Muck"
The Cache River State Natural Area is an absolutely stunning example of a well restored wetlands area. You will find this gem nestled within a floodplain, which was sculpted by the mighty flood waters of the Ohio River ages ago. The Cache River Wetlands is now fed by the Cache River and it's many tributaries and stretches over 14,960 acres in Johnson, Massac, and Pulaski counties in Southern Illinois. This scenic area also plays as a featured stop to many migratory bird species, including bald eagles, great blue herons and (a personal favorite) snowy egrets. In addition to the myriad of migratory birds you will undoubtedly catch an earful of the areas most vocal inhabitants as choirs of spring peepers, bullfrogs, bird-voiced tree frogs, American toads and more amphibians all sing together from the bogs to the boughs and everywhere in between. As you hike on the trails and boardwalks below you may also want to keep a keen eye trained for some of the larger warm blooded residents as many white tailed deer, squirrels, raccoon, beavers, foxes and mink call the area home as well. On our visit we were lucky enough to hike three areas within the Cache River State Natural Area (click to visit individual pages or read more below): Big Cypress Tree Trail (250 feet), the Section 8 Wood Nature Preserve Boardwalk (475 feet) and the Todd Fink-Heron Pond Trail (1.5 miles). Each of these short hikes were absolutely stunning and completely unique in their own way. These short journeys also seriously whet my appetite for a return to visit areas such as the Marshall Ridge Trail (2.8 miles), Lookout Point Trail (1 mile), and the Lower Cache River Swamp Trail (2.5 miles), but that will have to be another post at another time I suppose. the state champion is still an impressive sight! Beyond the wildlife that inhabits these wetlands, the area also boasts some truly spectacular plant life. 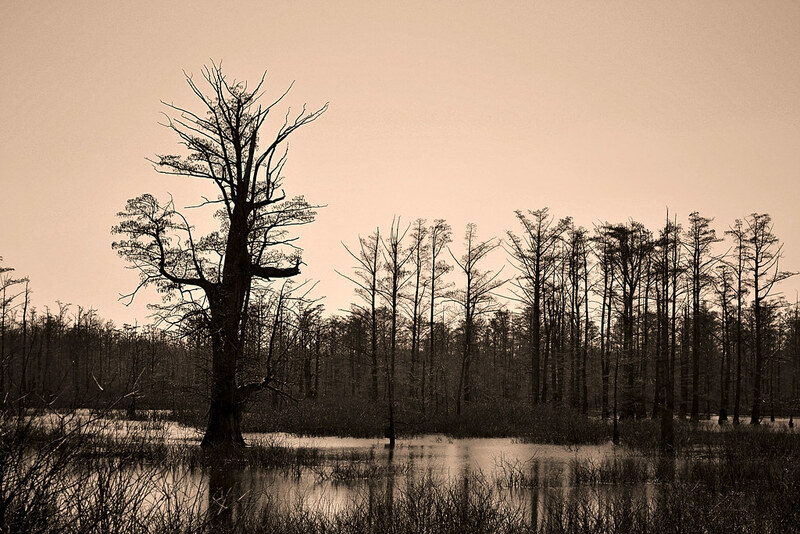 Throughout the Cache Area Wetlands you will discover ancient cypress trees with their flared bases and many "knees", which were mere saplings over 1,000 years ago, now standing sentinel over the rich, black-water swamps that still nourish them. 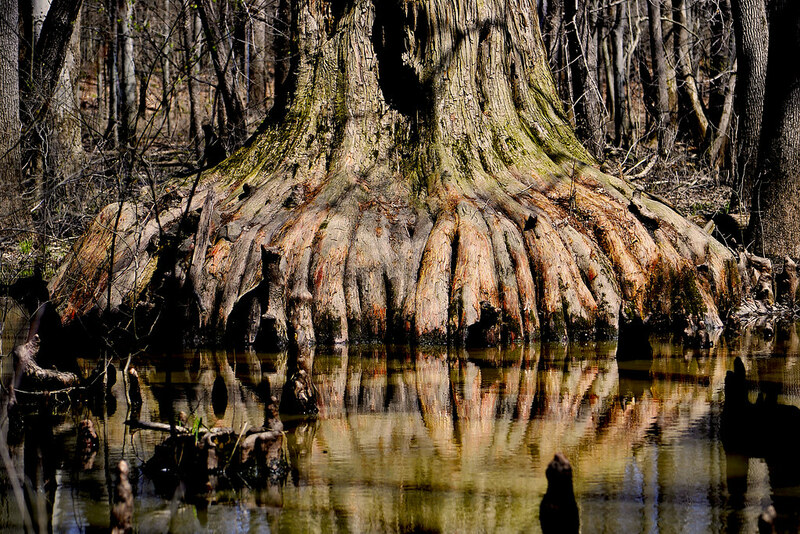 On the short, 250 foot Big Cypress Tree Trail you will find one very special bald cypress. This particular cypress tree has been so nourished by the rich waters that it has developed a remarkable base (also referred to as a buttress) of over 40 feet in circumference, which has earned it recognition as a state champion. As you make your way to the enormous namesake of this trail be sure to take note of the other plants such as majestic tupelo trees and low lying thickets of button-bush that share the landscape with the silent cypress colossus. See that cool "Zipper" effect? This short, 1.5 mile, trail begins simply enough. You'll find yourself descending into a mix of hardwood forest comprised of a mix of oak, hickory and sweet gum. As you reach the bottom of your descent you will come to a small truss bridge over which you will make your way over a convergence of Dutchman's Creek and the Cache River. If you find yourself crossing this bridge without setting an eye just upstream, toward the actual meeting of these two streams of water, you are missing a truly magnificent sight. 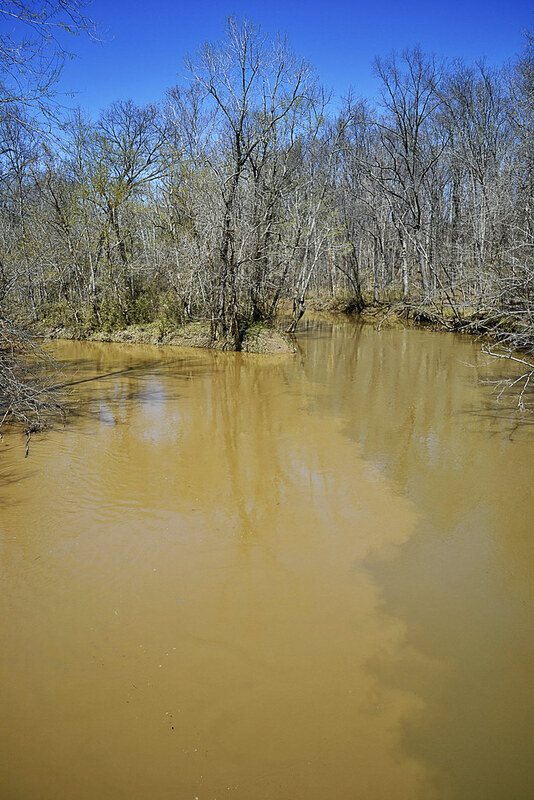 For it is here, just upstream, where the relatively clear waters of Dutchman's Creek and the rich muddy flow of the Cache River slowly merge, becoming one, but not before the waters dance together, swirling and circling, ebbing and flowing, creating an absolutely hypnotic effect. The trail continues on just the other side of the bridge, and closely follows the snaking trail of the Cache River. As you continue your hike you will find a fork in the trail, it is here that you will want to journey to the left and in just a few short yards you will find the Heron Pond boardwalk. 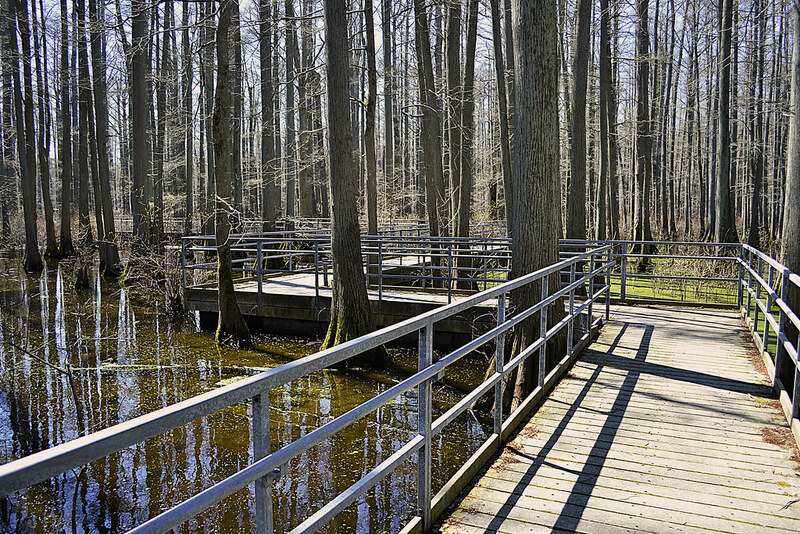 The Heron Pond boardwalk winds its way out and into the very heart of its namesake pond. 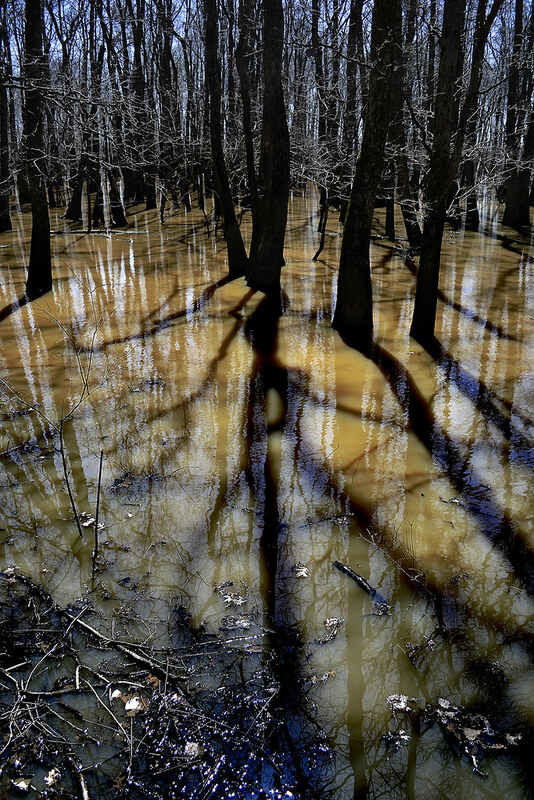 The waters here were more clear than we found at the Section 8 boardwalk, which allowed us glimpses of turtles, fish, insects, frogs and more as they swam among the giant tupelo trees and "knees" of the cypress here. In areas we found duckweed would obscure our little windows into the private underwater world of the swamps residents, occasionally these serene green mats of aquatic carpet would erupt with a violent "POP" as an underwater assassin would hungrily burst through the thin layer of duckweed in pursuit of an insect. You may want to begin your entire adventure to the Cache River Wetlands Area at the Barkhausen-Cache River Wetlands Center. Unfortunately the visitor center was closed when we visited the park on a Monday, but it certainly seems to have many offerings for you to peruse. It is located at 8885 State Route 37, Cypress, IL, 62923 and is now open to the public five days a week, Wednesday through Sunday from 9:00 a.m. to 4:00 p.m.
Cache River State Natural Area: Section 8 Nature Preserve Boardwalk - Take a stroll directly through a swamp without even getting your feet wet! Barkhausen-Cache River Wetlands Center flyer - This little beauty has many of the cool features of the center listed.